I am hoping you can help me to diagnose what I believe to be a disease slowly killing off my ember tetras. I am wondering if it is Pleistophora, but all of the symptoms don't quite seem to match up with that. Anyway, before I get into it, here are the basics of the tank. Planted 29g with Aqueon20 filter (with additional/better filtration media) and sponge filtration, kept at 78-80 degrees F. Water parameters are good and I do ~30% water changes once per week (sometimes it goes 2 weeks). I use soft, slightly acidic tap water that I treat with Seachem Prime. I have occasionally dosed the tank with Flourish Excel but generally don't add anything to the water except Prime for conditioning during water changes. This tank has been set up for around 7 months. I feed 1-2x per day. Most days they get a bit of Nutrafin Basix Staple Food and Nutrafin Bug Bites Cichlid Formula. Around 1-2x per week I feed them Hikari frozen brine shrimp and I also add about 1/2 of a Hikari algae wafer a few times per week (though I don't think the embers get much of that). Over the past 7 months they have gotten Hikari frozen blood worms maybe 6x and freeze-dried blood worms maybe 20x (though they haven't gotten any blood worms in the past probably 1-2 months). The first fish I added to the tank were a few embers. Since then, I have added a few more, as well as the other listed occupants (more or less in the above listed order). Over the course of the past 7 months, I have lost 3 ember tetras but I have had no other illness or suspicious deaths in this tank (one ram got wedged and died behind the intake sponge on my HOB). I blamed the first ember death on stress or injury related to transfer between tanks. A few months later, I found another ember dead in the tank. other than some fuzziness/tissue damage to the stomach area and dark areas inside the stomach cavity. I have done some searching on WWM and what I am experiencing sounds VERY similar to the posted email 'Mystery ember tetra illness' from Lea on 8/25/12. and the images have not been cropped, just resized. The first microscope image is wet-mounted without a cover slip. The focus is poor but this pic lets you see how spherical the objects are, as well as the black 'filaments' covering their surfaces. 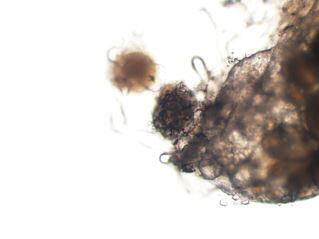 The second microscope image is of a cluster of similar objects wet-mounted between slides. Prior to squishing them, they were spherical and clustered together kind of like grapes. These ones did not have the back material surrounding them as some others did. If you zoom in, you can see how some of these spheres seem to be dividing. 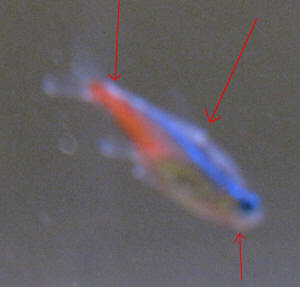 The third microscope image is of the black speck that is visible toward the tail of the tetra in the first image. It was hard to tell if this speck was embedded in the muscle tissue or just pushed toward the far end of the gut cavity. I dissected it out of the fish and wet mounted it. Prior to mounting, it seemed spherical and was completely covered in the same back filaments as some of the other objects were. It easily squished flat between slides, it was not hard or difficult to flatten. I think this image might have been zoomed in a bit more than the others, but this object was noticeably larger than the others. I have several more images if you would like to see them. I just didn't want to bog down your server with all of them at once. I scaled down the attached images as much as I could. Please let me know if the resolution is too low. 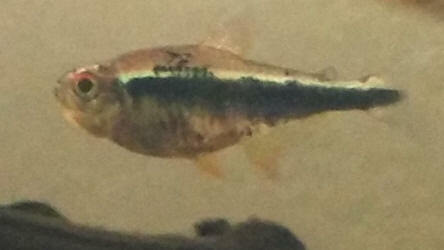 I would also like to note that my Ctenopoma likes to sneak up on the embers and Pencilfish occasionally and bite their tails, but they seem to recover from these bites very quickly. I am working on an alternate housing solution for my Ctenopoma (I really don't want to give him away - he's such a character) I realize that the tail nipping may be exacerbating the situation with the gut pathogen but I don't think the two are directly related. Just wanted to share this as a further detail. I am not sure how or with what I should treat this tank. I have posted to fish lore and got some educated suggestions. I have also talked to Andrea at Aquarium101 (my local fish store) and she recommended that I contact you for advice. She said you have been amazing help with their Flowerhorn, Jiana, and her swim bladder illness. I am dying to know what this pathogen is and if there is anything I can do to treat it. Also, if it is likely to spread to the other species in my tank. So far suggestions have been Praziquantel and Metronidazole, both of which I have but I have not treated the tank with either yet. I would very much appreciate your expert feedback. Thank you for your response! Looking forward to hearing more. I have attached higher resolution images this time. Hope that’s ok. Also wanted to point out that the bush fish is a Microctenopoma ansorgii. I wasn’t sure if the proper genus for this one was Microctenopoma or Ctenopoma. Sorry for any confusion on that point. First and second images are zoomed in, I think to 200x, from two of the previous images. The others are just higher resolution of previous images. Everyone else seemed healthy, so I convinced myself this was just another 'fluke' death (pardon the pun). I was hoping there was no disease problem in my tank but these losses made me suspicious, so I have been keeping a close eye on it. I lost the third ember about 2 weeks ago. from the first 2 deaths other than some fuzziness/tissue damage to the stomach area and dark areas inside the stomach cavity. I have done some searching on WWM and what I am experiencing sounds VERY similar to the posted email 'Mystery ember tetra illness' from Lea on 8/25/12. I am hoping you can help me figure out what is going on. I didn't get any pictures with this ember's stomach intact, but I took some after she died (first pic attached). I stored her in the fridge overnight and looked at her under a microscope the next day. Since I lost the majority of the 'growth', I wasn't sure what I would find, but I believe I have some images of whatever this pathogen is. The scale bars didn't export properly with the images when I saved them however, they are at 100x-200x magnification and the images have not been cropped, just resized. The first microscope image is wet-mounted without a cover slip. The focus is poor but this pic lets you see how spherical the objects are, as well as the black 'filaments' covering their surfaces. 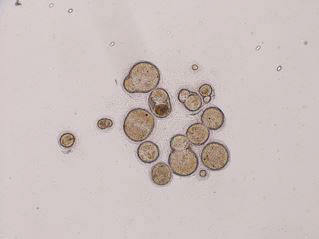 The second microscope image is of a cluster of similar objects wet-mounted between slides. Prior to squishing them, they were spherical and clustered together kind of like grapes. These ones did not have the back material surrounding them as some others did. If you zoom in, you can see how some of these spheres seem to be dividing. <Does sound like some sort of protozoan parasite. If that's the case, something along the lines of Metronidazole would be the better bet. them at once. I scaled down the attached images as much as I could. Please let me know if the resolution is too low. Praziquantel and Metronidazole, both of which I have but I have not treated the tank with either yet. I would very much appreciate your expert feedback. Hope you all are doing fine. Thank you for the excellent site. My tank is in its 6th year and it owes a lot to your site and things I learnt (and still learning) from it. 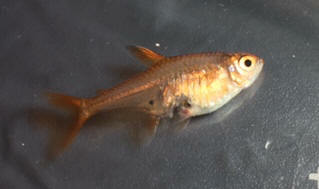 Question: The attached images are of one of my 8 X Ray Tetras (*Pristella maxillaris*). They have been in this 29 gallon for a little over 2 years. It is schooling, active, eating but I am worried about the dark patches. Are they signs of NTD? Still no classical pale discoloration or deformation but one of my Black Neons showed similar patches in the past and on your suggestion (and my decision) I euthanized it. Tank mates are other tetras, Cory cats, pair of Bristle Nose Plecos, a Whiptail L010, a Pearl Gourami. No fish added in months, nor diseases or deaths. Tank is heavily planted. Filtered by three 500 lph HOB filters packed with sponge, bioballs, ceramic rings and Seachem Denitrate. No Ammonia and Nitrite. NO3 40, 35% weekly water change, pH 6.9, TDS about 200 ppm, temp avg 27C. Fed Ocean Nutrition, Hikari and Tetra flakes and pellets, occasionally freeze dried Blood, Tubifex worms and parboiled kitchen veggie cuts. Request you for some guidance on the possible course/s of action. Isolating is bit difficult as my other tank has a leak and I would need to keep in plastic tub. Thanks again. You people are too good. Thank you for the clarifying reply. I shall await Neale's input as well. Is this fish a threat to others even when alive? I mean can the infection spread to others or is it usually passed on when other fishes consume the remains of an infected fish? If it can be helped I would like to delay the euthanizing till the fish is more affected, as it is a depressing thought and it is so difficult to catch one in a heavily planted tank. I shall employ the 2 net method. Secondly how did the protozoa, assuming it is so, get into the system? and do not feed live foods. Can plants or snails carry them? Or can it lay latent as I had to 'put out' a Black Neon with suspected NTD more than a year ago? I am just trying to understand the issue better. <Agreed; doesn't look like classic NTD, but certainly a sick fish of some sort. Worth treating with a general purpose antibiotic or antibacterial, for example Kanaplex, to see if that helps. Costia is another disease worth considering. It is fairly common, and typical symptoms include stress colouration (often oddly dark or pale compared to normal) and patches of white or grey (excess mucous) on the body. Also known as Ichthyobodo and Slime Disease. Request you for some guidance on the possible course/s of action. Isolating is bit difficult as my other tank has a leak and I would need to keep in plastic tub. After inputs from experts like Bob and you I have a much clearer idea of the road ahead. I plan to observe for a couple of more days and keep offering optimized conditions as the fish is otherwise very normal in sense of activity, shoaling and feeding. Then with indications of worsening if any, shall isolate, treat with Kanaplex and hope for the best. By the way though the links didn't work in Google Chrome, I could navigate to the said pages at the FishChannel site and read them. Lucid, informative and helpful articles as always. Thanks for everything the other day! I guess a follow up on our previous conversation would be good. I now have the African cichlids living in the fridge case i told you earlier, arranged some rocks and sand and two small powerheads making water turbulence, Ph is 7.7 and water quality tests are good so far. I didn't get the Acara; clerk at the lfs (the one i told you has severe issues) knows me and knows what i have in my tanks and when i told him what i wanted the Acara for told me that it would be too risky, as it would probably bully the glass catfish and stress everyone while looking for a territory. Just then when evaluating i noticed they had ... boesemanni rainbows! They had just arrived yesterday so i got 5 of them; A safer option i guess. They are now being quarantined in a 10 gal, they are very small and have not developed their brightest colors (that or they are heavily stressed, cant tell). 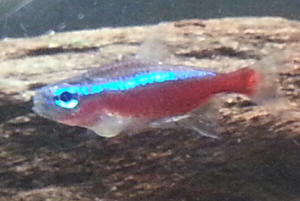 I also noticed a sale on neon, cardinal and black neon tetras. There were actually just 5 neons, 3 cardinals and 2 black neons, and i actually have seen these guys sit in their tanks for about 3 weeks without anyone taking them. I got all of them. Since my temperature range is in the meeting points of the upper for neons and lower for cardinals i guessed that maybe i could keep them together, am i right? now, i searched for black neons but haven't found much. these guys are all in my second quarantine (i have a few empty small tanks i got very cheaply just in case haha). This quarantine, however, has a few hardy plants i can remove whenever i need to medicate (ferns, Anubias and hornwort). It is an 8 gallon with ph 7.1, ammonia, nitrite and nitrate are 0,0,5, wasn't running with a filter but i took an extra sponge from the catfish tank and an air pump thing into an air diffuser. Its been a day and all the fish seemed fine, however, noticed today that the cardinals aren't eating, and whats more one of the neons is hiding in an upper corner, hidden by hornwort and just blankly staring at the glass without eating or moving much. The rest of the neons, black neons and cardinals are hanging together and feeding well (except for the cardinals, which don't show interest in food). First thing that comes to mind is neon tetra diseases for the neon, but these guys have been at the lfs for about 3 weeks, shouldn't he have died already if he does have NTD? shouldn't the other fish be infected and displaying symptoms as well? Im a bit puzzled here, all the fish seem well fed and display normal coloration. Also thought about stress but im very paranoid about diseases. I sincerely hope you can help me, thank you very much in advance for your time! Thanks a ton for the incredible service you provide to let us take better care of our charges. Much appreciated. 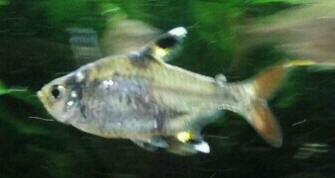 The attached picture is of one of my shoal of 8 Black Neons. Any idea what the markings might mean? Others do not have anything similar. They are 4 months in the tank, no change in appetite or behaviour. pennywort and duckweed, Indian Almond leaves, submerged roots, river stones, caves, sand substrate. Temp is now above 30C from an Indian summer. It has a laminar flow fan blowing across the surface, no artificial lights. 20% weekly water change, feeding from Hikari Micro pellets, sinking wafers, Ocean Nutrition Brine Shrimp plus and Spirulina flakes and Tetra bits. Freeze dried bloodworms occasionally. I dose K2SO4 as per EI and Seachem Flourish Comprehensive and Iron. Thanks for the inputs. I shall act accordingly. Apologies for the delay in updating. I went the clove oil route the day I heard from you, it seemed to be the safest (but tough) option. 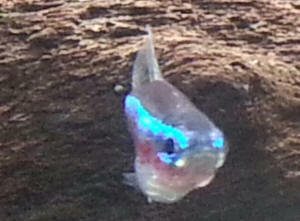 Since then no signs of contamination yet; the remaining Black Neons, Cardinals and Rummy Noses are doing fine. Hi Crew, How are you? My name is Daniel and I'm facing a strange problem with my characins fishes. It seems like a parasite problem but I'm not sure of which kind. 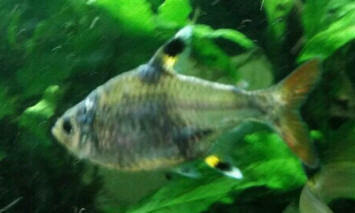 The symptoms are: 1- Little white spots in fins and eyes. 2- Eyes sometimes clouded but not the entire eye! Just a portion of the cornea. 3-Some thin "things" like a baby's hair attached to the fish. My fishes are eating well. They aren't rubbing against nothing. All symptoms seems to be cyclic and the cycle seems to be fast (days to weeks). I took that pics from the eye of my H. tatauaia yesterday, today that eye is almost completely normal...but the other one turned cloudy today. *Note that besides the "large eye spot" there is some small too. *Note the "thin hair thing" in the back of the A. falcirostris. My water parameters: no ammonia, nitrates.. I really don't know, temp 28-29 Celsius, Ph 6.0, WC every week, they eat frozen fish (entire fish not just fillet). What is this? How can I treat? Looks like an embedded fin spine to me. Hi Bob, thank you for your reply! I don´t have any trace of nitrites right now. The problem is happening in at least 5 of my fishes. It seems to be very cyclic. In 48 hours patches appear in the eyes of the fishes. First they appear as cloud eyes and after sometime they turn white "concentrated". After a day you can see very "thin things" (thinner than a hair) leaving the eyes or fins of the fishes and the eyes became clear for 2 or 3 days and when you think that everything is ok, it happens again. It is absolutely weird. The Payara picture represents the concentrated phase (white). I will resend you a picture with less pixels. I'll check my nitrates tomorrow, my test is "out of date". Normally I do 50% WC every 7 days. I 'll follow your advice and do it more frequently. Starting out with details and parameters: I have a 30 gallon tank that I set up almost three months ago. A month and a half a go, I got 3 Neon Tetras and a Ghost Shrimp. Two of the Tetras died very shortly, so I waited two weeks, checking parameters, and then got two more Tetras. They have been fine until about four days ago. My Nitrates and Nitrites are at 0, but my ammonia is at .25ppm. My tap water reads for over 1ppm straight out of the tap, so I have been using Prime and I get false readings for my ammonia concentrates. I did a 25% water change two days ago, and before that, the ammonia read at 0ppm. I am having trouble identifying a disease that my Tetras seem to have. It started out with one Tetra hiding instead of schooling with the others. <Is what Neons do when stressed, though is often associated with "Neon Tetra Disease". Such fish should be promptly removed, and to be honest, euthanised (I recommend the Clove Oil method as cheap, easy and humane). Today, I noticed that my Ghost Shrimp had white spots on him, as well (he disappeared for 3 days and I almost thought he was dead). I Googled to see if invertebrates can get fish parasites, and the general consensus was that they cannot. Between the shrimp getting spots and my fish getting worse instead of better, could the disease not actually be Ich? <The photos are too blurry to be sure, but the fish look to me like they might have either Finrot or Whitespot/Ick, it's just not clear to me. 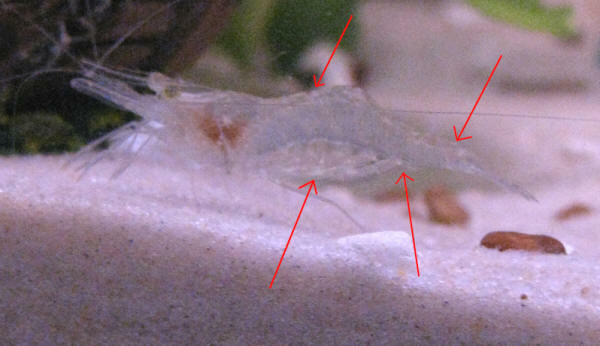 Is there another disease that they might have, or is it just a coincidence that the shrimp also has white spots? <The latter; shrimps can't get Whitespot. For sure they might suffer in some way from poor water quality, but Finrot as such isn't going to happen. I have included pictures, but they aren't terribly great because everyone in the aquarium moves so fast. In the pictures, I have tried to point out spots where you might be able to see the white spots. Thanks in advance for any help, you guys are an amazing source of knowledge, and I have learned so much from your site. 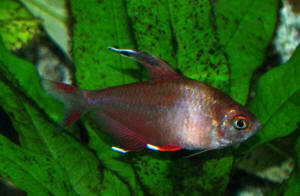 I need your expert advice with one of my cardinal tetras. It has what looks like a lump on the area under its gills. I attached two pictures I hope you can see them. It started as a white patch a few days ago and now it looks almost transparent with what it looks like a white worm inside. I have not tried any medication yet. He is eating ok and schooling with the others. I have 5 other cardinals and 1 Amano shrimp in the tank which are all looking good. The tank is a 12 gal planted with water parameters of: ph 7.5, kH 6, gH 7, ammonia 0, nitrite 0, nitrate 5, temp 82. I use RO water buffering with baking soda to 6 kH and adding some SeaChem flourish for the plants once a week when I do the 30% water change. I also have a diy co2 system. I've had the tank set up for about 3 months. I did the fishless cycle successfully thanks to some great advice from the awesome Bob Fenner. And added the fishes and shrimp about 2 months ago. No problems so far except for this issue now. If you know what it is and how to treat it if there is any treatment for it. Any comments and advice will be appreciated. I attached two pictures, I hope they come through. There has been no change in the past 24 hrs it is still the same. The worm is not moving it just looks like a s shape white worm almost like a hair inside a water blister. <It's very strange indeed. I haven't encountered a problem like this. but they don't treat exactly the same things. If it were me, I'd be inclined to give General Cure a try, but let's see if anyone else recognizes this. Taking blind shots with meds is stressful for the fish. I'm a long time fish keeper, and run a small maintenance service business. So I've seen my share of illness and have my own tools for dissection etc on hand and can usually pin down most common illnesses and pests. Yet, I've an issue with my ember tetras in my home display tank that has me baffled. I have 9 embers, 3 panda Cory, 2 albino Cory and 4 three-line Cory in a 60L (15G) planted tank. It's been running years with zero issues and great plant growth. However, i seem to loose <lose> an ember every few months. I've lost 3 so far. As they are somewhat transparent, I've notices the occasional tetra with black masses in various points around the internal organs. They sometimes occur behind the gill, sometimes above the swim bladder, sometimes near the kidney etc, and once there seem to spread slowly in the body. The affected fish is quite fine, active, eats well, good colour for 2-3 months, and finally looses colour, begins breathing rapidly, and at last keels over in about a week or so. It seems like some sort of internal parasite which causes little trouble until the load becomes too much, and then the fish succumbs. Most of the other fish are disease free, and it seems usually one is affected at a time. I've tried catching infected animals to remove them (and hopefully the disease) from the tank, but in a heavily planted set up it's near impossible. I've not tried anything for treatment save excellent diet and water quality as i dislike treating with meds unless I'm certain what I'm dealing with, and often I've found good care often helps most fish resolve problems themselves. Tank parameters are: nitrates at 10-20ppm, 0ppm ammonia & nitrate, pH 7.2, GH 4 degrees, KH 3 degrees. Weekly 30% water changes. Tank is dosed daily with Flourish Excel, and every 2nd day with liquid ferts (Aquamaster brand). I've attached a few pics of the latest case. They don't seem to be nodules, flukes etc, so not sure if a very tiny helminth, bacterial or protozoal mass. <Sounds/reads like one of the many "mysterious" Microsporozoan, Microsporidean infections; quite common w/ imported Characins from the wild. Do see Ed Noga (the second ed. if you can... avail. as an e-book am given to understand) re. 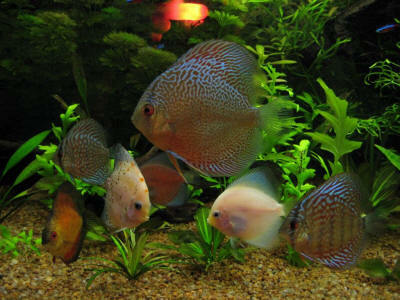 Acumen Aquatics - Premium Fin Safe decor, aquarium installation, aquascaping, assistance & service. Thanks for the good book reference. That's sad news, but again appreciate your expertise. I did find one site pertaining to microsporidia which suggested possibly Metronidazole - though not specifically for fish. Here's the link if you are interested, it's from Stanford. I will continue to keep water quality and diet excellent, and i can only hope the shoal shakes it with their own immunity in time. I will try adding garlic to boost immunity, and have also given a treatment of a combo formalin, malachite green & Acriflavine to maybe assist in interfering with any water-borne spores (i consider this combo a good broad-spectrum against various gram positive, negative, Protozoans and fungi, which Microsporideans are in the same family). A long shot but i feel it can't hurt too much at this stage. I will see how this goes after a week, and if no improvement i will discontinue and try Metronidazole in a week or two after the former meds have cleared. I am always wary of over-medicating and stressing my fish. My pleasure Bob - i hope it is of some use. I was a biologist in my former iteration, and i enjoy research and problem solving to this end. Speaking of which, i euthanised my ill tetra last night and performed an immediate autopsy. I found a large infestation of very tiny black particles approx 0.5 mm (barely visible) which seemed slightly oval under my 5x lit magnifying glass. They were not within nodules (like presentations of nodular disease images shown in the Chris Andrews book), but rather simply clustered together. They were present in the stomach, around the liver, in the kidney, and up behind the brain to the extent that pop-eye was a final symptom. I'm picking up a microscope next week to investigate further and have saved samples of some of the heavily infected sections in water in the freezer (hopefully the main structures will not be ruined when i thaw). I'm am wondering what else they could be, as they seem to infect like Microsporideans, but these black specs are far to large (given i can see them just with the naked eye). Maybe some internal protozoal infection, or a very small internal fluke? I guess it may also be possible that these are simply actual fish cells which have turned black by engorgement of smaller parasites. If you wish I'll keep you posted and send some images once i collect my microscope. As you say, it is heart-breaking as that last thing i wish to do is tear down this beautiful planted tank. Several of the tetras seem unaffected, but that's not to say they are not latent carriers. Will monitor and let you know. Also just found that Metronidazole is not available in Australia unless you seek out a vet, so it may take a little time to find a specialist i can obtain some from. Have you much experience or success with mixing Metronidazole and food? will yield to greater experience. Hello, I apologize in advance for the lack of photographic evidence. Four months ago I bought 6 X-ray tetras to start my 20 gallon tank. The tank was fishless-cycled with ammonia 0, nitrite 0, nitrate 10, temp. 77F. Three weeks ago one of the tetras developed an inclusion in its back---a pale sphere, about 1.5 mm in diameter, above the spine and below the dorsal fin but attached to neither. There was no external sore or swelling (if the fish weren't transparent, I wouldn't have been able to see the thing.) The fish behaved and ate normally and showed good coloration. Now, three weeks later, the "tumor" has shrunk and looks like a grain of sand suspended in its back. The fish still seems healthy and none of the others show any sign of this thing. Is this a parasite? Have you seen or heard of this before? the fish doesn't seem to be in any discomfort and we observed it feeding ok, however on closer inspection of the other cardinals we've noticed that three of them appear to be affected by some form of worm - the fish are each showing one large 'blister' of around 3mm on their sides which appear to have a thin white worm inside, no more than 1mm in diameter. We tried unsuccessfully to remove the affected individuals from the tank last night, when examining the fish this morning one of the blisters appears to have ruptured as it now resembles a wound rather than a blister, and I noticed one of the worms attached to another tetra, but without the surrounding blister. So far the only fish that seem affected are the cardinals but I suspect if it is a parasite without a specific host then it will spread to the other fish in the tank. Please help...I know that I will likely loose more fish by tomorrow if not sooner. Should I medicate the tank, and if so with what? I am very concerned that medication will hurt or kill my catfish (Corys and Farlowella). Thankfully all Corys, the Farlowella and the Oto cats seem great, in fact they seem to be enjoying the new-found space. I am probably taking a shot in the dark here but I'll ask anyway, regarding my ongoing saga of fish dying (see below and recent emails with Neale). 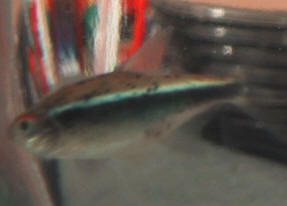 My six remaining tetras are still translucent with no colour whatsoever but they are eating and otherwise seem okay. They are in a separate tank. I don't hold out much hope but I see no signs of distress at the moment. But I just witnessed something in my 20 gallon tank (which was the source of the significant fish loss recently - see past email thread). I have 5 Oto cats in that tank that have been there for roughly 4 weeks...not too long after I introduced them did I discovered the rosy tetras starting to decline. I have never seen them bother with the other fish...however just now I put an algae wafer on the bottom and the Corys scurried over to eat. I saw two of the Otos also go to the wafer. Then one of the Otos tried to suction on to one of the Corys and was successful for a moment! He then tried to do the same with my sword who swam away. This is the first time I've ever seen one of the Otos interact with the other fish. The other fish seemed scared and went to hide. Wondering if this behaviour was just competition over the algae tablet...or is it possibly that my fish have been dying because of this? I know that there can be confusion between certain algae eaters, some being more aggressive than others, but I didn't expect that from Otos and hope they weren't the cause of my fish loss! Again, a shot in the dark, I know, but thought I would ask. 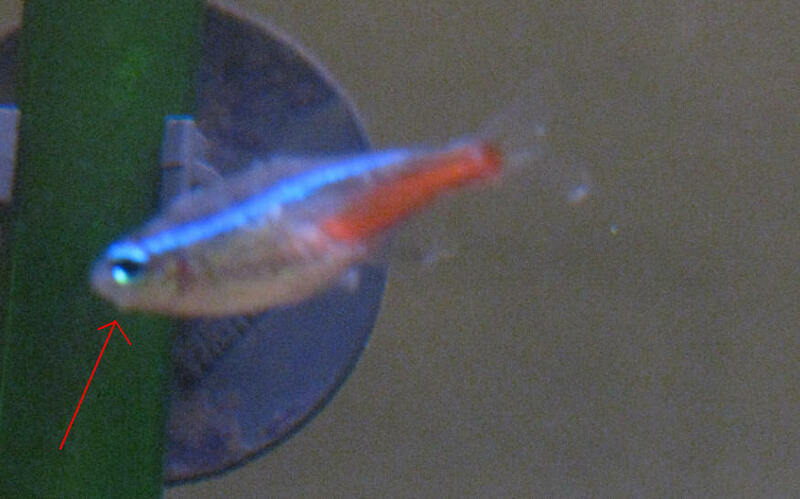 I have a neon tetra with 1-2 spots of Ich and pop and cloudy eyes. I can also see white extended patches on his body. but I'm not sure which one I should use first. I'm also planning to buy food with antibiotics so that I can treat the intestines too. What do you suggest?